Have you ever wondered why you didn't receive enough applications or the right applications? How can you find out why? The solution lies in the targeted collection of data in recruiting. In this article, we want to clarify the importance of data collection in recruiting using a job advertisement from RUNNERSPOINT. 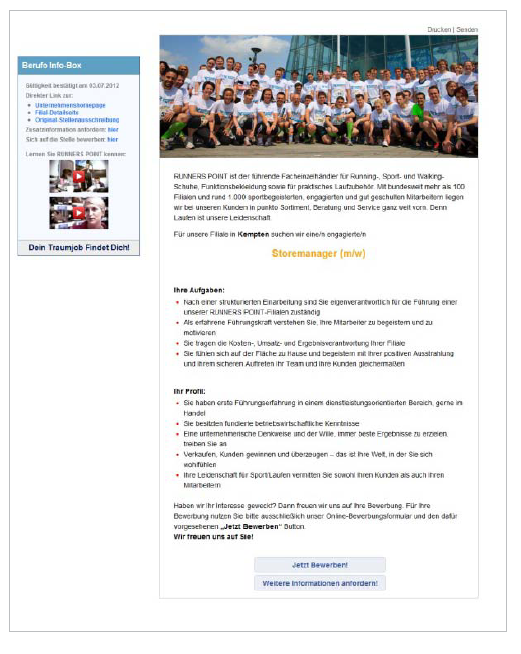 The company RUNNERSPOINT was looking for a candidate for the vacancy "Store Manager" for their Kempten branch in 2012. First, a candidate market analysis was carried out. This shows which channel is the most suitable for placing the job ad. It is important that you place your job advertisement on the right channels. Analyze on the channels where your target group is active. You also need to find the right job title for the advertised job. The right job title is essential for being discovered by your target audience. Did you know that 30% of job advertisements are not found by candidates at all? If you use the wrong job title, your job ad will not be found. Once you find this information, it is time to place your job ad. In the RUNNERSPOINT example, the job ad had a classic one column structure. The upper part was a large picture with two runners and the slogan "TRAIN YOUR TALENTS!" On the right side of the screen is the logo and the instructions to contact the human resources department. This is followed by a short description of the company with the key incentives, what makes RUNNERSPOINT an attractive employer, the location and title of the vacancies, the description of the tasks and the profile requirements. In addition to the job advertisement, RUNNERSPOINT has provided a separate document the describes the company benefits in detail once again as an exclusive download for interested parties. This campaign ran for two months and the following metrics were collected. A total of 1,272 interested parties clicked on the advertising material, but only a few stayed longer on the ad and there were just two applications. The high bounce rate (the high number of visitors who left the job after only a few seconds) showed that the upper part of the job advertisement did not peak the visitor's interest. Accordingly, the lower part of the job advertisement was not noticed. After interpreting these findings, they changed the the upper part of the job advertisement. The ad image was replaced and an "info box" integrated to the left of the job ad. The rest of the ad was not changed. This ad ran on the same channels for a month. 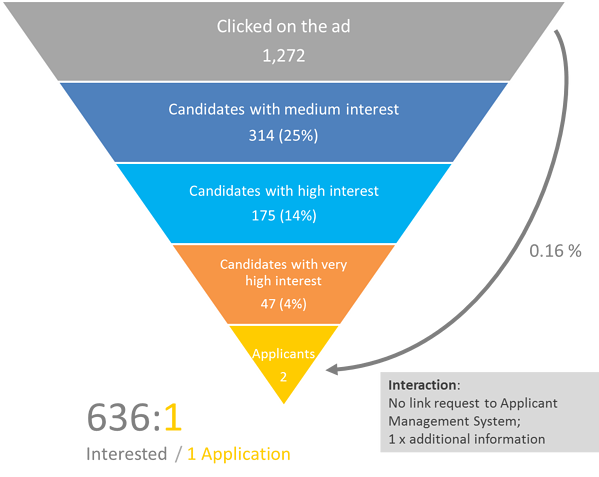 The optimized job advertisement generated significantly more interest, above all deeper interest and interactions were shown and more applications were received. In total, the ad was clicked 493 times and 11 applications were received. The emphasis on a good working environment (work-life balance), highlighted by the exchanged running group image in the upper, central attention section of the ad, made this variant more successful than the first and led to significantly more applications. 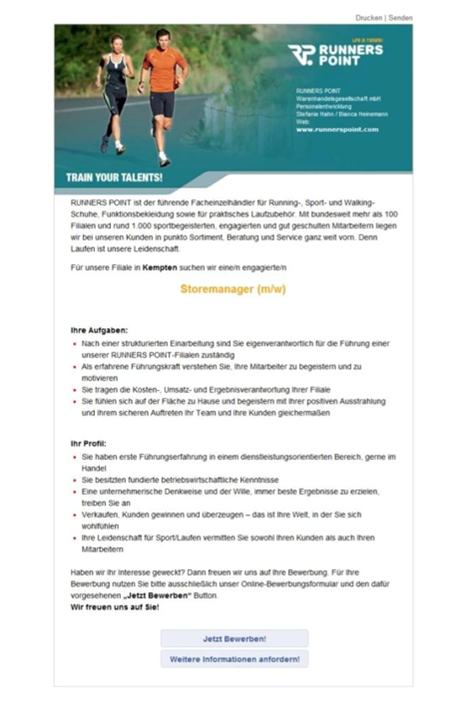 RUNNERSPOINT managed to improve their relationship with the interested parties in the target group and the incoming applications by 92% through targeted optimization in the ongoing recruiting process! This is a great example of how important the clear communication of attractive incentives and their placement is when addressing candidates. Second, the example illustrates the importance of collecting and analyzing data in recruiting. Without data analysis, the job advertisement wouldn't have been so easily adjusted. Talention offers you all the building blocks needed to collect such data in recruiting and to optimize these points in a next step. We would be happy to have a one-on-one conversation to show you what an analysis would look like in your case. You can sign up for a free demo here.